At BITC’s annual general meeting on 6 December 2018, Medline was named as one of a few specially chosen companies to participate in BITC’s new Responsible Business Tracker, which was launched in 2018. The Tracker is a questionnaire-based tool designed to enable a business to measure its responsible business performance. Known as the forerunners, Medline and 81 other companies will receive a detailed assessment of their individual submissions from BITC, as well as a separate report on insights and trends. Participation in the Tracker capped off a successful year for the CSR department in terms of engaging with BITC. 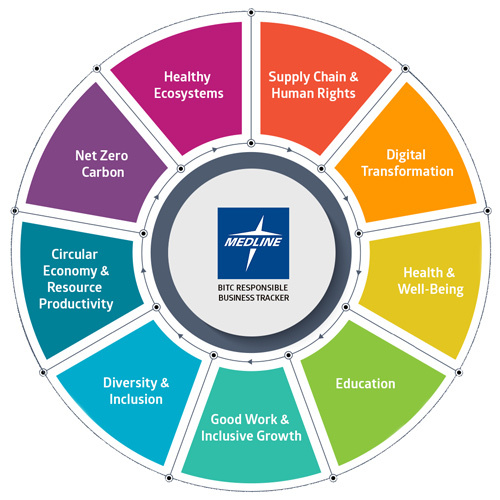 Medline was on the evaluation panel for BITC’s 2018 Responsible Business Awards, and received information and advice from BITC on topics such as the sustainable development goals, modern slavery and sustainability reporting. Business in the Community (BITC) is a United Kingdom-based membership organisation that cultivates socially and environmentally responsible business practices amongst its 750+ member companies. Medline has been a proud member since 2016.